I love the monoblock Volk Racing wheels. And more, acknowledging they are not everyone's cup of tea, I love white wheels. So, needless to say, I think these wheels are killer. Especially the TE37RTs. I received a package this past week and could not, for the life of me, think of what I had ordered. When I sliced open the tape of the brown cardboard box to reveal a slightly smaller white box from Craft Square, I was pretty stoked. It has been months since I placed the order, so I was not at all sure when I would actually see them. After tearing through the multiple layers of plastic, bubble wrap, and styrofoam, I was floored with the detail and beauty of these mirrors. Stunning. My Z needs a lot of work to justify putting these on it. I acknowledge that I have posted this before, but it is my favorite poem and there is no better time to post it on a blog typically devoted to automotive content than on Valentine's Day. Enjoy the now 6 year-old video (Yikes!) from Format67. Happy Valentine's Day from JDMphasis! It is what it is... Authentic! When did it become the norm to qualify a For Sale post with the word "authentic"? Visit just about any automotive forum for any platform and browse the classified section. Look on the marketplace pages on the various social media platforms devoted to selling automotive parts. You will not see, for example, "FS: Top Secret Rear Diffuser for 350Z." You will likely see: "FS: Authentic Top Secret Rear Diffuser for 350Z." That one word irks me. In the hypothetical that I stumble upon a post advertising a replica part for sale and the word "replica" is not included in the title or, at the very least, the description of the item being sold, I would feel as though the seller is attempting to deceive potential buyers by advertising the part as something it is not. However, simply listing an authentic part for sale by stating exactly what it is does not seem to be enough these days. We almost always see the word "authentic" somewhere in the advertisement. Am I the only person who thinks this is sad? Perhaps I am nit-picking. Nonetheless, the default is to now stress the authenticity of a part. This is in no way a criticism or indictment of the sellers of these items. I am guilty of this as much as the next guy. It is more a commentary on the state of the tuning industry. 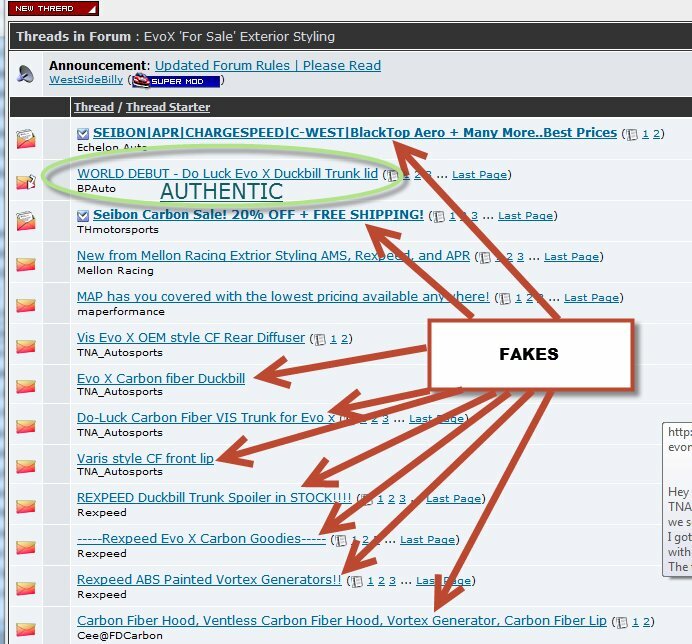 It has become absolutely necessary for sellers to emphasize the fact that the part they are selling is authentic due, in large part, to the fact that there is an overabundance of replica and knock-off parts flooding the marketplace. It should not be this way. I should be able to post "Top Secret Carbon Fiber Rear Diffuser - 350Z/Z33" without worrying that someone may just assume it is a Shine or Outcast Garage or Flavor of the Month Replica Aero Company part. Again, maybe I am bothered by something relatively insignificant in the grand scheme of things, but when one cannot visit a classified section of a forum without seeing sponsor after sponsor slinging fake parts or look through a marketplace page and scroll down page after page without seeing the name of one legitimate Japanese manufacturer without a hyphen and the word "style" after it (Ex. Amuse-style), there is something wrong. The money-hungry replica parts manufacturers are not going anywhere. They will always be here to steal designs and profit from someone else's hard work. So, I believe it all starts with the so-called enthusiasts. Have some pride in your project. Refuse to cut corners. Refuse to reward intellectual property theft. Accept that a worthwhile build is not going to happen overnight. E-fame and Insta LIKEs is nothing compared to the satisfaction of building a project you can say, unequivocally, you built the right way. The picture posted below is a few years old at this point and I believe I originally saw it when my friends at Bulletproof Automotive posted it (and I have likely posted it on here before), but I think it is a good visual into exactly what I have stated above. A sad look into the state of the tuning industry and the rampant replicas. I have heard some stories about Tommy Kaira and industry feuds, etc… I have no idea which stories are legitimate or the background behind who did what to whom or went behind the back of the other. I just know that I have had a couple Tommy Kaira Hebi Bebi shift knobs for different projects over the years. In my opinion, it is one of the nicest feeling, weighted knobs out there. No, I have not experimented with every single knob to ever hit the market, but I have had a few. (I love my Nismo GT Ti knob, as well.) When I stumbled upon a Limited Edition Hebi Bebi (with the signature TK turtle in blue), I jumped on it, seeing as the blue will go nicely with my color theme. I do not exactly need another shift knob, but, even if it does not make it into my Z, it will look nice displayed somewhere.